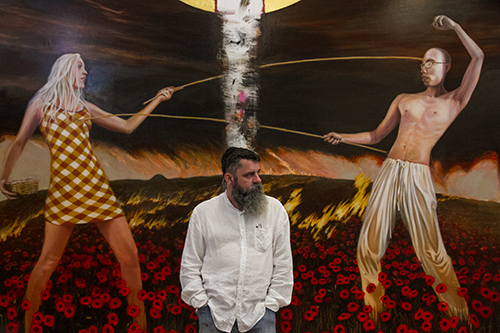 Artist Michael Pearce with his work, "Endless War." California artist Michael Pearce’s “The Secret Paintings” will open at the Nona Jean Hulsey Gallery at Oklahoma City University with a public reception from 6 to 8 p.m. Sept. 1. The exhibit will be open from Aug. 21 through Oct. 20. The gallery is located at 1609 N.W. 26th St. It is the second stop in an ambitious tour spanning the United States, including venues in California, Alabama, Florida and Texas. “The Secret Paintings” is a series of 26 large canvases recalling Renaissance and pre-Raphaelite masters in their ambitiousness, complexity and scale, and in their theatrical grandeur. In Pearce’s latest spectacular four-panel painting, “Chariot,” which spans 32 feet, a circle of girls parade in a jubilant celebration of the sun. Other dramatic images include a commanding magician dressed in stripes casting a spell, a skeletal angel of death wading through a sea of skulls, and a pilgrim traveling in a picturesque landscape overwhelmed with flowers. Pearce uses the ancient imagery and traditions of his British ancestors, introducing them into magical settings starring beautiful women and handsome men. The paintings pay homage to diverse cultural landmarks including Harry Potter, the Bible, the “Da Vinci Code” and medieval tarot cards. Gallery Director Holly Moye said “The Secret Paintings” strike a chord for a new kind of art moving forward from the weary pessimism that has dominated international art for the past century. “Pearce’s paintings are optimistic, beautiful and democratic and designed to appeal to an American audience,” Moye said. Pearce is a popular and influential leader of the international representational art community. He co-founded TRAC (The Representational Art Conference), bringing artistic heavy-hitters such as Odd Nerdrum and Roger Scruton to California to meet their American peers. For more information about the artist, visit www.gildedraven.com or call (805) 444-7716. Admission to the Nona Jean Hulsey Gallery is free to the public. Gallery hours are 9 a.m. to 5 p.m. Monday through Thursday.